First things first. 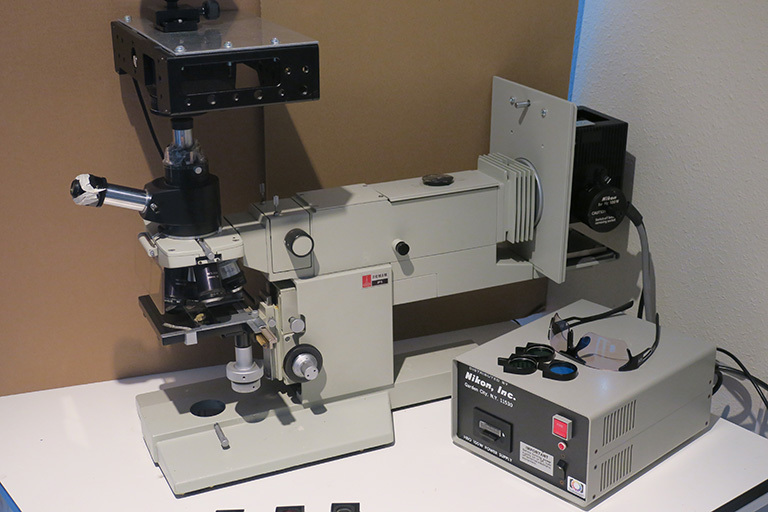 Seven years ago I acquired via a local classified add a "Lomo Lumam luminiscence microscope" (R1). When visiting the seller, it became clear that the lot consisted of a serious amount of different items, covering a.o. phase contrast, brightfield , darkfield, oil and water immersion objectives and... epi fluorescence. Before I continue, a very short explanation about luminiscence and fluorescence may be useful. Photoluminiscence is defined as emission of light not created by an object with a high temperature. (like the sun or a lightbulb). The principle of fluorescence is that (molecules of) the object "absorbs light at wavelengths within its absorption band, and then nearly instantaneously emits light at longer wavelengths within its emission band." In practice the specific wavelength of the mercury arc lamp light will be directed through an excitation filter and a "dichroic beamsplitter". This light will then be absorbed by the object followed by emission of light with a longer wavelength. This light will pass the emission or barrier filter, which will cut off all light produced at other undesired bandwiths. 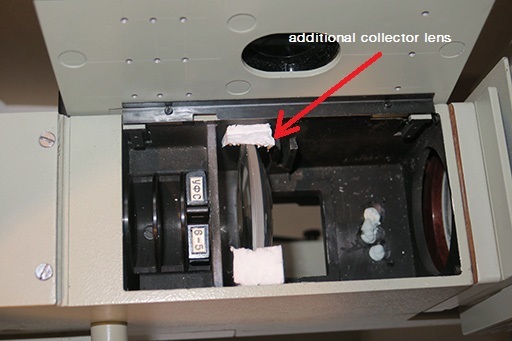 In many classic (pre-led) setups for fluorescence microscopy the mercury arc lamp cooperates with a so called "filter block", which is a combination of above menitioned exciter, beamsplitter and barrier filter. Manufacturers of microscopes have created a range of filter blocks, each tailor made for a specific combination of those 3 components. Are you still reading this article? Good. Now back to the Lumam. The microscope was manufactured in the USSR 35 years ago, one of its most striking features was the gigantic lamp house that accommodated a 250 Watt high pressure mercury arc HBO lamp. Now Soviet made technology has the reputation of being overdimensioned and the Lumam R1 is no exception. Mercury arc lamps do require a very specific DC power supply, "in order to provide an up to 50 kiloVolts starting pulse". For this lamp, the designed power supply itself weighed over 30 kg, with an Ampere meter that went up to 10A. I am not sure whether the unit was fused at all, however when starting it up it made a frightening loud humming noise, which remained throughout the session. Meantime the power cable got seriously hot and after a session I found it discoloured as well. To make a long story short: I had to say goodbye to both the lamp (with its nice asbestos gaskets and slightly corroded connections) as well as its power supply. When I started posting on this forum 3 years ago I've been using the instrument without that feature, experimenting e.g. with feeding white led light through the epi-objectives. Mmmm. So the plan was to restore the fluorescence functionality. On one hand as an alternative high power leds turned out to be very popular. But how would they cooperate with the filter cubes and would the intensity and distribution of led light be comparable with what came from the original mercury arc lamp? Therefore I wanted to stick to the original design as much as possible, and continue using a HBO lamp. Now 250 Watt mercury arc lamps are rather extravagant and affordable combinations of complete lamphouses with operational power supplies are rare (read: impossible to find). Finally I decided to give it a go with the popular 100 Watt variant, and that's where this project started. 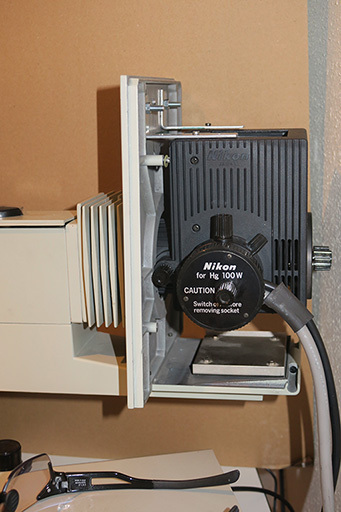 A Nikon Optiphot 100 Watt lamphouse and power supply were found for a reasonable price and installed in position of the original lamp house, utilizing a part of it (see below pictures). Important within the whole setup are the epi objectives. Initially, the 9x and 21x magnification objectives were part of the set, later it was easy to find the 40x and 95x lenses via Ebay. They're all M27 thread, which is wider than the standard RMS that can be found on most microscopes. Parfocality was another issue. The objectives, obviously designed within the same range somehow turned out to have different distances from the object. 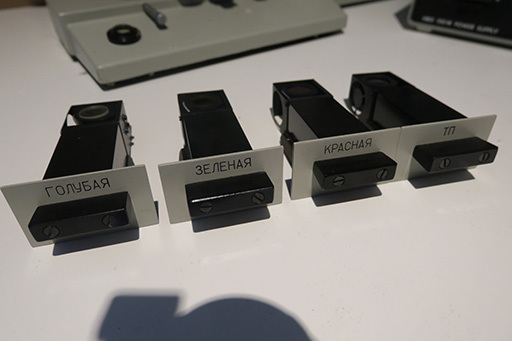 I've discussed this issue with a well known Lomo reseller in Russia a couple of years ago, and he was kind enough to find a solution and based on his technical library, started producing extension pieces with the correct length. 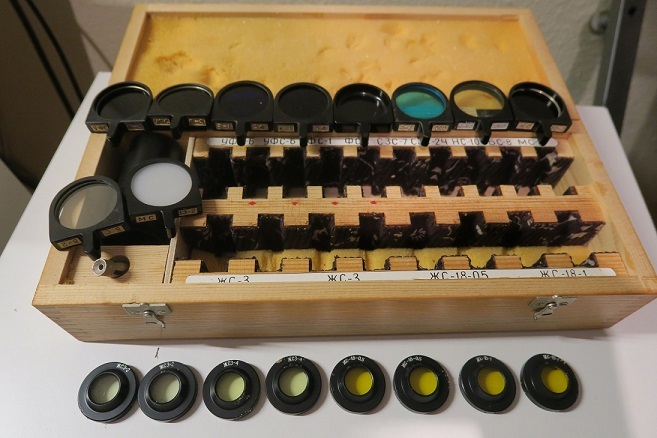 The original set had three filter blocks as well, labeled green, blue and red, each with its own combination of dichrioc mirror/barrier filter. (A fourth one was "empty", to be used for reflected darkfield observation). Furthermore a range of 16 excitation filters was supplied, covering several specific bandwiths. As the mercury arc lamp cannot be dimmed, in order to reduce the light intensity, identical filters can be placed in series in the designated slot. That is the reason why Lomo exciter filter sets often have double -or even more- identical exciter filters. The Lumam can handle three filters at the same time, see below picture. 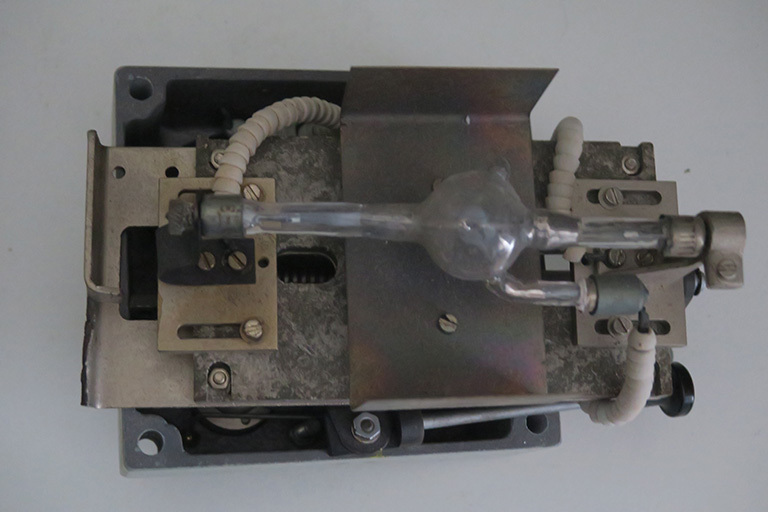 After starting up the unit (the hour counter of the power supply had been reset by the previous owner), the mercury arc lamp had to be adjusted, in order to create a good image of the light source. As I had to learn more about this instrument, googling make and type name, also in cyrillic turned out to be useful: a 13 page instruction manual for the Lumam range...in russian..., was found. (http://neoton.su/d/312290/d/-data-documents-lumam_r8_lomo.pdf) In order to improve my russian, I started reading it and discovered the specific recommendations made by Lomo for combinations of exciter filters with filter/mirror blocks. (as mentioned, contrary to other makers configurations, the exciter filters are completely separate from the filter block units.) When crosschecking these recommended combinations, most of mentioned filters where not part of those 16. Fortunately a seller in Russia was discovered who could provide that "missing link" for a reasonable price. Expect to receive these soon. So basically that's the half time score of this project. With a bit of trial and error various filter combinations were tested and I feel the results are encouraging. The blue filter block is providing interesting results with one specific exciter, resulting in red for chlorophyl and white for cellulose in plant material, the green filter is useful for pollen, see below test pictures. Unfortunately it is hard to conclude how many hours of life are left in the HBO lamp. Fortunately a sealed replacement bulb was found for a fraction of the normal price, would like to wait a while with replacing it and first assess the performance of the current bulb. Dang! That thing is a lovely beast. Makes my Lomo Biolam look very toy-like even though they share their design aesthetic. I'll be following the progress of this tank of a microscope. It looks great, in a soviet overbuilt fashion. That's a super toy and I'm sure you'll be producing wonderful images from it. Thanks for posting, it's perfect for threatening my wife. Great project and enormous determination on your part. You deserve great results! The test images look quite good. Did you ever find any monochromatic LEDs that matched some of the strong mercury lines, especially the 436nm line? I have had trouble getting that line. I bought three "435nm" lasers on eBay, but now there are no such lasers to be found, and I think the "435nm" labels printed on the lasers may be typos for 445nm lasers. The beams do not pass a 436nm filter. I thought the failure to pass was because I could not achieve strict perpendicularity to the filter, but now I wonder if the result indicates these are not really 435nm lasers. 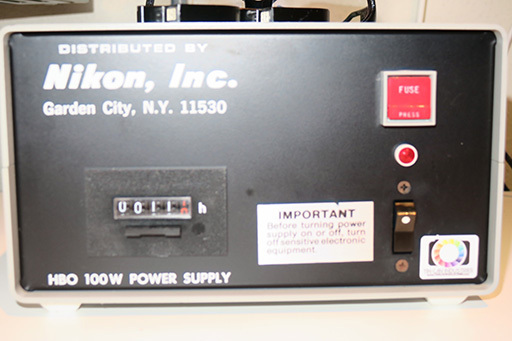 @Chris: The old power supply is still available, kept in my cellar. Very original wedding present. Preferably pick up, otherwise be aware of a substantial shipping fee. You mentioned a 435nm laser (most likely a 445nm one for real) and the fact that the associated 436nm filter is blocking the beams. Aren't there similar filters available with a bit broader bandwith? Also regarding high power monochromatic leds my experience is limited. I've just been experimenting with a spotlight from a deejay store that included blue, green and red led, (and alltogether white light) but despite the rated 15 Watt max. power consumption the intensity of each led was very low, absolutely nothing compared with the hbo100 lamp. Discovered a fourth filterblock designated for Ultraviolet for sale somewhere in the former Soviet Union. Would surely be a nice addition to this retrofit. If I'll be able to buy it, it will probably take a couple of weeks before it will arrive, so patience is required. Below the 4 different barrier filters for respectively green, red, blue and ultraviolet (all 17mm diameter). Aren't there similar filters available with a bit broader bandwith? Lasers are essentially perfectly monochromatic so they don't need a filter of any kind. I was just using the filter to check the wavelength. The lenses I use are optimized for the blue mercury line at 436nm +/- 5 nm, so that is why I am looking for a good source for that line, such as a good mercury lamp. My narrow cut-off filters will then be needed, to block out the other colors. this is a nice project! and with good results. 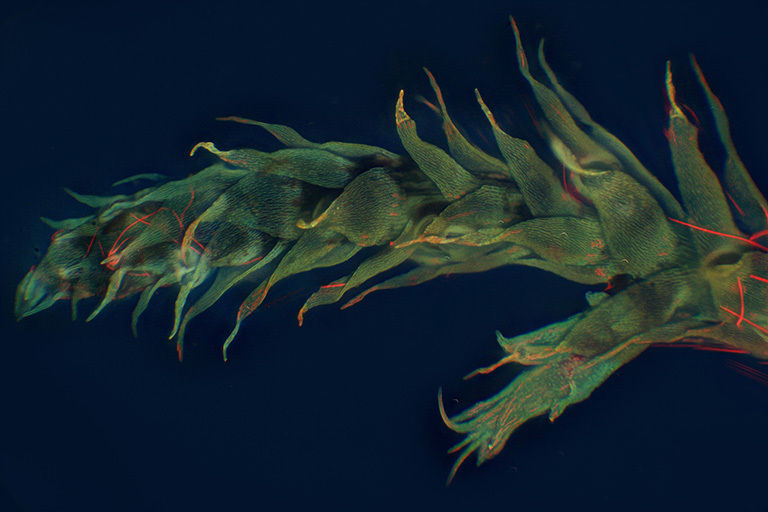 Not necessarily, there are many types of laser used in microscopy that emit at multiple wavelengths, sometimes half a dozen distinct ones (not to speak of exotic things like white-light lasers, or femtosecond lasers that emit radiation that shifts in wavelength as it travels along a special optical fiber). But it is true that ordinary solid-state lasers typically emit at a single wavelength. Pau, yes, I have interference filters. Enrico, as far as I can tell, my lasers should be monochromatic. In my past life as a physicist I used to work with tunable dye lasers, so I could produce light at any wavelength I wanted. Wish I still had access to that stuff. @ Pau: Yes a diffent approach is to switch over to coloured leds like demonstrated with that beautiful multi-led setup you created. Understood that in that case even when exciter and barrier filters have been ommitted, it still works for the bigger part. On the other hand even led light is usually not one single bandwith so exciters and barriers are still being used by some. 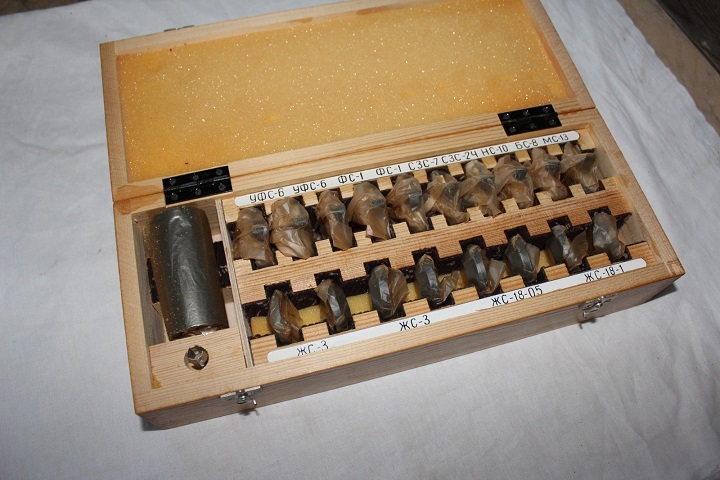 Last week I received from Russia a wooden box with additional exciter filters, each filter still in paper. On the vertical axis the transmission rate in % light intensity can be found, against the bandwith in nm. I discovered that Lomo worked with various thicknesses of similar coloured filters, which is indicated by the last digit. so -3 means e.g. an exciter filter of 3mm thickness, -5 = 5mm etc. Of course the thicker the filter, the lesser the light that finally will be transmitted. The spectre visible for the human eye is between 380 and 750 nm, with ultraviolet and infrared each on one side. 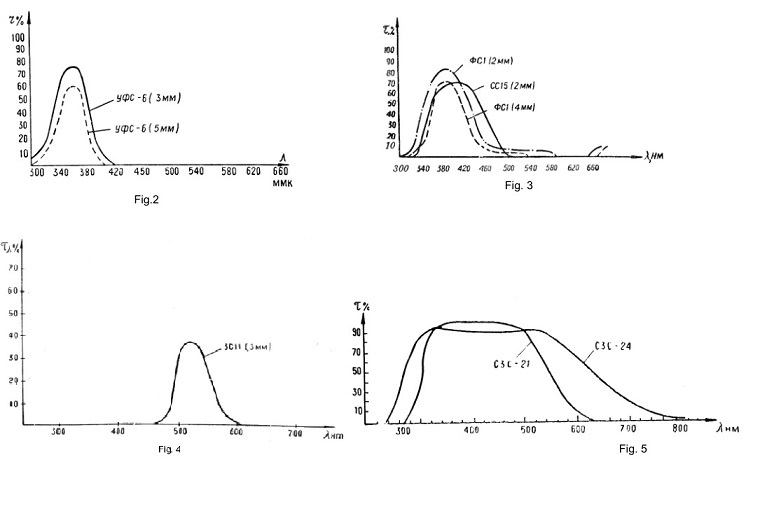 Above graphs indicate the UV block peaks at 350 nm, the blue one between 380 and 410, Barrier filters C3C-21 and C3C-24 would be cutting off red and infrared transmission according fig. 5 in above. The 3C11 exciter filter e.g. results in a transmission rate of about 40%. This is actually an inventory of all known Lomo exciter filters, each with their own characteristics graph! The document shows combinations of dichroic mirrors, exciters and barrier filters available for various applications, the characteristsics for each combination respectively shown in green, blue and red lines. If you like you could take a look at my latest post, covering a couple of images taken the last couple of days. 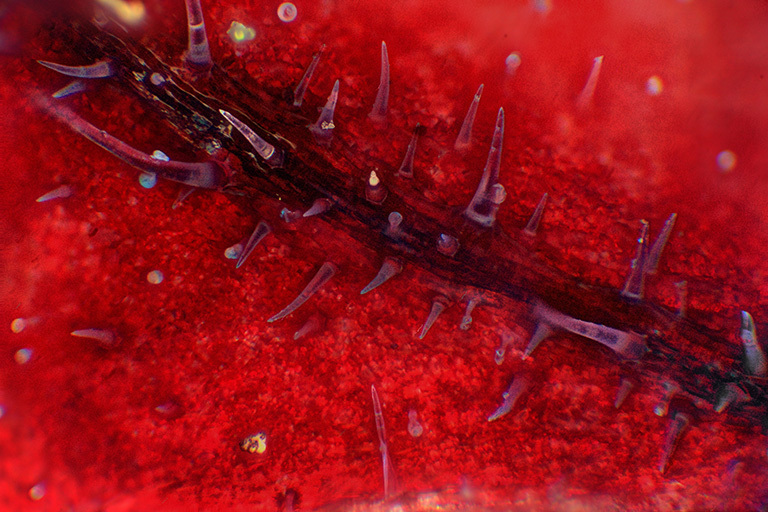 (under photography through the microscope, later today). With my Leitz setups I was used to the afocal approach, taking pictures through a camera objective and a (photo) eyepiece. 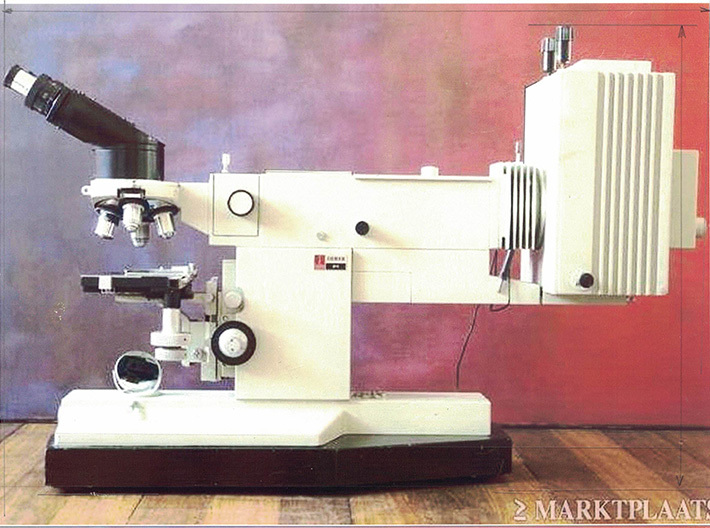 With this microscope that resulted in images with unacceptable high amount of spherical and chromatic abberation. 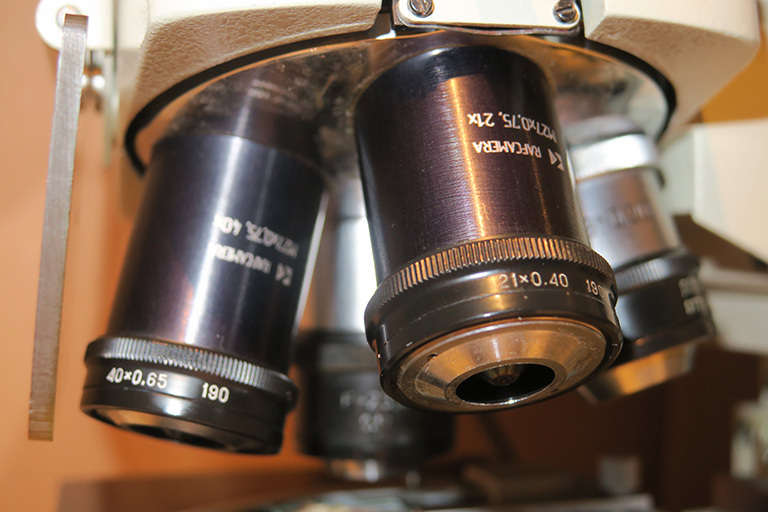 For now, the DSLR camera lens has been removed and the image from the microscope is projected direct on the camera sensor which is CMOS or "medium frame". Ideal would be a full frame DSLR combined with the Olympus NFK 2.5x (on order), e.g. the Canon EOS 5D Mark ii. Second hand bodies of that model start at approximately EUR 500... thinking about that investment. 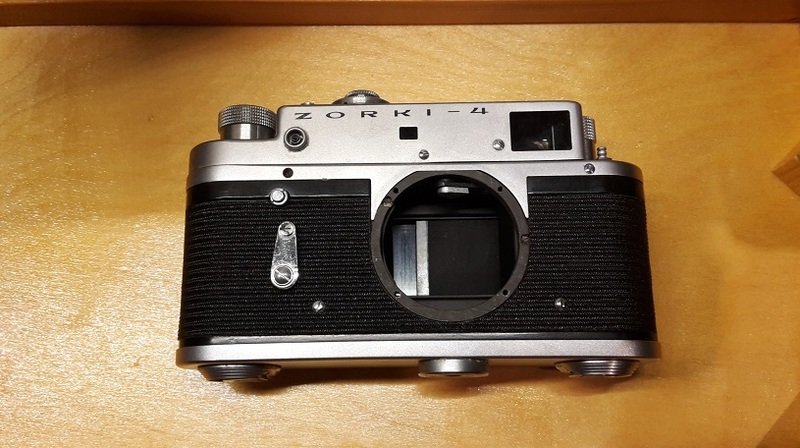 To finalize today's update, below picture is showing the camera from the original set, the Zorki-4! Walter, you will have lots of combinations to experiment! In fact I did some tests and in almost all cases emission filters are needed. When excitation and emission wavelengths are well separated* the excitation filter can be suppressed, but in most cases it works better with it in place. Understood the key of fluorescence microscopy is the interaction between the lightsource, the exciter/barrier filters and dichroic mirror in the light path and the reflection finally produced by the object. I've highlighted what seems a wrong part of the sentence, likely a typo. Fluorescence is not reflection but emission of different wavelengths by molecules present at the sample, naturally present (autofluorescence), or due to added fluorochromes. Because fluorescence is in most real life cases much weaker than the excitation light you need to cut off any reflected light. Congratulations on getting such a collection of cool toys! I am not sure the M27 extension tubes would work well for your 40x and 95x objectives though. Is your extension tube for 40x less than 10mm long? That 95x extension tube may give too much tube length error, though it depends on you exact tube configuration. If you have some LOMO parts that you do not need, please feel free to email me at (zzffnn at h0tm8il) to discuss possible sale. 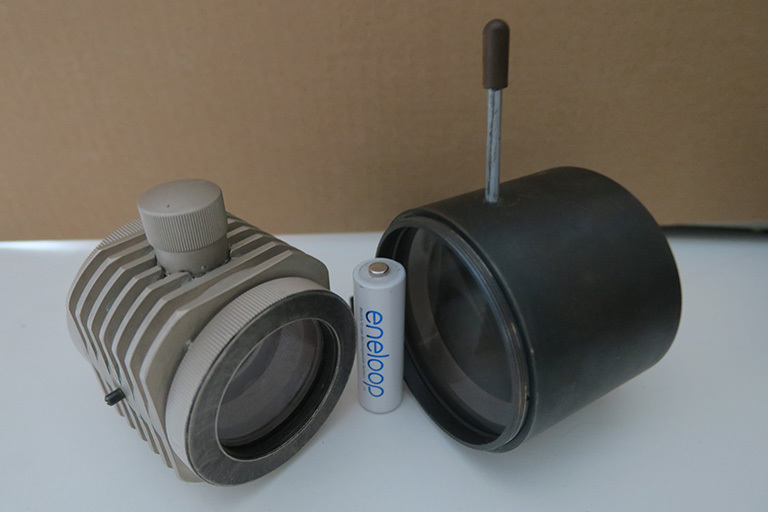 I am looking for a vertical monocular variable (140-200mm) tube, for example. I am pretty sure the 95x extension tube would give too much tube length error. Fan, Could you explain please this calculation and extension advice above a little more for me because I am having trouble grasping the difference between the tube extension required on the 40x vs the 95x and the reference to your question " Is your extension tube for 40x less than 10mm long?" I have some of these 190 Epi Objectives which came with a Lomo MBI 15 which has yet to receive attention for a seized focus block and could use them in a 160mm tube length rig. Could they be used in an over 190mm tube length? 210mm? Thank you. That was a great help.